Tidewater Community College Theatre will present the John Steinbeck classic “Of Mice and Men” in the Black Box Theatre from Nov. 17-20. The theater is in the Academic Building on TCC’s Chesapeake Campus, 1428 Cedar Road. Show times are 7:30 p.m., except for Nov. 20, which is a 2 p.m. matinee. 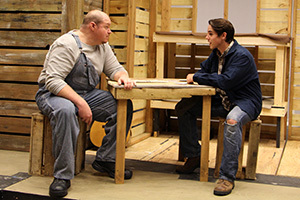 TCC’s production of “Of Mice and Men” is providing 10 student actors and six lighting and stage technicians the opportunity to put to use the skills gained from their studies at the college. (Warren Reese) talk things over. “Of Mice and Men” chronicles the lives of George Milton and Lennie Small, two displaced migrant ranch workers, who move from place to place in California in search of new job opportunities during the Great Depression. The two pair grand delusions of living off the “fat of the land” and making enough money to buy their own place. Lennie is a man-child, a little boy in the body of a dangerously powerful man. It’s Lennie’s obsession with things soft and cuddly that troubles George. But when an accidental death involves the gentle giant, George is faced with the moral question of how to deal with Lennie before the authorities find him. Tickets are $10 for adults and $5 for students and seniors. Payment is by cash or checks at the door. The box office opens 45 minutes prior to show time. You can also purchase tickets with a credit card at the Chesapeake Campus Business Office in the Pass Building during normal business hours. For more information, call 757-822-5219 or visit artsattcc.org.